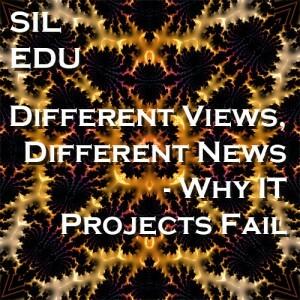 What constitutes failure for an IT project and the reasons for that failure has been a hot topic for many years. SIL performed hundreds of thousands of annual IT risk assessments that track the performance of the projects, as well as the perception of success and failure. That information has been analyzed to highlight not only the causal factors and correlated characteristics, but how the different organizational perspectives form different metrics for success. Using the main viewpoints, i.e., executive management, line-of-business (LOB) management and software engineering, this presentation discusses and highlights factors, practices and challenges in identification and communications about IT projects. Data was obtained from detailed tracking on over 503K projects where all groups agreed that the project had failed. Additional analysis is covered that includes over 1.8M projects where the judgement of failure was not unanimous. This lack of consensus is a systemic problem in organizational dynamics today. It ripples through the organization as a divisive influence, degrading communications, cooperation and the construction of a corporate unified identity. It begs the question - If only part of the organization thinks an IT project failed, is it really a failure? 1 – Discuss the demonstrated organizational viewpoints, conceptual framework and communication challenges in IT project management and sponsorship. 2 – Illustrate each section with supporting analysis from other organizations’ real-world experience. 3 – Examine the challenges and opportunities that are present in either encouraging or quashing the different perspectives of success and failure. 4 – Explore the different metrics and measurements that are useful in integrated success evaluation, tracking and follow-up. 1 – Participant will gain an understanding of the differing perspectives of success within an organization. 2 – Participant will have an understanding of critical characteristics and processes that allow a shared organizational view of success. 3 – A successful participant will understand how to implement the actionable steps presented in the webinar, to support an integrated perspective on IT project success. Primary audience for this course are professionals who are responsible for IT project sponsorship or management within an organization. Project managers, executives and IT technical team leads will benefit from the information provided in this webinar.